This is going to be a bit emotional for me, but 100% honest. I have read a very early version of this book, kind of a beta read, before Anna had an agent or a publishing deal. I knew it was something unique and it ought to be mainstream published. My gut instinct and recognition skills were dead accurate: Something like two years later it got picked up by Harper Voyager, I screamed “Hell YES!” and bounced with joy as if it were my own book. So here goes your disclaimer. However, I do only honest reviews. Anyone knows me well enough knows I won’t review the books that aren’t my cup of tea of I don’t enjoy/DNF. I have refused reviews like this for books of folk I know, cause I can’t be dishonest and I don’t want to damage the ratings of a new debut just cause I don’t enjoy it. All eternity, they’ve been fighting. All the edges blunted. Sword edges and knife edges and the edges in the mind. Keep killing. Keep killing. Keep killing till we’re all dead. The Court of Broken Knives is grimdark as grimdark goes. There’s rivers of blood and pools of vomit but also beautiful gardens with jasmine and lilac trees, colorful silks, marble palaces, desert wilderness and frost covered islands, and the most important aspect of grimdark: Highly intriguing, complex, deeply flawed, incredibly realistic characters. There are four point of view characters: A mercenary commander, a new recruit in the mercenary company, a politician from the high nobility, and a high priestess. None of those are the sort of people you would exactly root for, but their storylines are compelling in the extreme, and along with the beautiful, flowing, poetic prose they make The Court of Broken Knives a total page turner. He must have been happy, sometimes, this man who would die before him under his knife. Must have looked at something once and thought ‘this is a good thing.’Must have loved and wanted and desired and hoped. And all of that he’d take from him, like it had never been. This is not the best example of what I’m talking about but I’m taking pains not to spoil anything, so it should at least give a hint. The most important character is Marith, the pretty boy who is a new recruit in a mercenary band. He is more than what he appears to be, and you can tell from the beginning. He turns out to be a highborn guy on exile, and then more and more is revealed. To keep this review spoiler free, that is the most I can say. Marith is one of the darkest characters I’ve ever read, he takes the grimdark to a whole another level. The main theme is a decaying empire with its gold veneer chipping away and oh so amazingly depicted. He watched the weaving figures, twisting in a long spiralling pattern of stamping feet around the square, dancing and shouting and singing while the darkness ate at them. You will all die, his mind whispered. This brightness is only the surface. Beneath is the darkness: you will all die. This is one of the rather tame ones, dude is DARK! But he is so much more than must a bloodthirsty psycho. Marith has mysterious magical powers, and a profound darkness in him. The magic business is quite a mystery, never explained. It just unfolds and you read with a dropped jaw. This doesn’t seem to be common in fantasy, since detailed magic systems seem to be the trend in the genre. I like the dark, mysterious, scary magic, and The Court of Broken Knives beautifully delivers. If you are sick of magic systems with endless lists of rules and components and whatnot, you will definitely love the magic here. The Court of Broken Knives is a political intrigue fantasy, and one of the main characters is a plotting high lord who is ready to sacrifice lives for the greater good. The M/M romance between him and his partner in crime Darath is quite adorable. Their flirty bickering is funny and cute. If you are a fan of M/M relationships you will absolutely love it. They are all kinds of cute, but there is the element of tragedy, dark choices and guilty conscience trying to justify horrible deeds. It is a grimdark story, after all. Thalia is the high priestess character, and some of her chapters are from the first person perspective, which works quite well with the flow. She is also a messed up victim of the culture and society, and we get to see the twisted and brutal religion of the Empire. The worldbuilding depth truly shines in those parts, giving a good glimpse of the culture and faith embedded deeply into daily life of the people of the empire. I don’t want to give too much away, but the whole twilight taboo culture reminded me of the superstitions we had in Turkey, that it is bad luck to do any sewing or repair works in the twilight hour, time between day and night is dangerous and you aren’t supposed to do handiwork or it will bring curses and bad luck. Thalia is about as broken and flawed like the rest of the characters, she is strong at times, but cannot conjure her inner strength all the time. Which is hell of a lot more realistic than the invincible female hero model. There are no heroes in this book, anyway, there are just people who are trying to survive or escape from their demons in a harsh world. I am a huge fan of rich worldbuilding, and The Court of Broken Knives has some excellent details like street food, cool trinkets, city scenery and every aspect of a major city from the grand palaces to drug dens,colorful and pretty gardens, as well as awesome wilderness scenes and an impressive harbor/fishing town part. Oh and there are dragons, too. Not as a major element, but they are part of the world, featured in a few neat scenes. 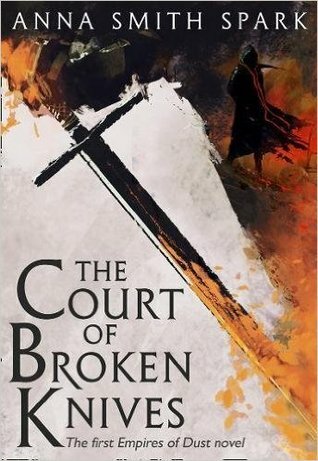 The Court of Broken Knives is an impressive debut, not only for grimdark subgenre but the fantasy genre as a whole. You are missing a damn lot if you aren’t reading it. I have feeling Marith will end up one of the milestone characters of Grimdark, like Logen Ninefingers, Jorg Ancrath and Sand dan Glokta.